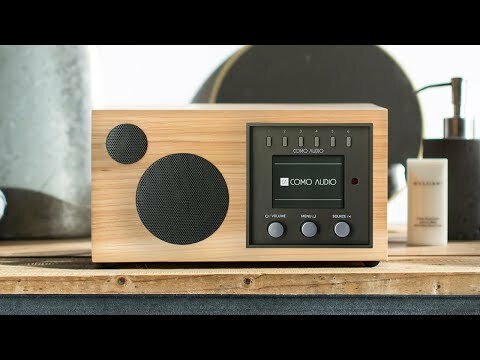 Inside this classic, 70s-inspired wooden design lives a robust-yet-portable hi fidelity digital radio. Designed by sound guru and Audio Hall of Fame veteran Tom Devesto, this music system is smarter than its good looks. The Amico has eight hours of of wireless playback and weather-resistant wood exterior so you can listen outside. Customize its buttons to play music from different sources (FM, internet radio, Bluetooth, Spotify Connect, etc. ), and save favorite stations/sources. It’s perfect for on-go-the tunes. Dimensions: 7.64" x 14.06" x 7.17"
Housed inside each of these classic compact wooden designs is a customizable, hi-fidelity digital music player. Invented by Audio Hall of Fame veteran Tom DeVesto, this smart speaker makes the digital analogue. Customize its preset buttons to play directly from all sorts of sources (FM, internet radio, Bluetooth, Spotify Connect). There are a few variations to choose from, and all feature two aux inputs, an alarm clock (so you can rise and snooze to your favorite tunes), and a remote control. The solo is perfect for smaller rooms, while the Duetto can entertain a larger crowd. 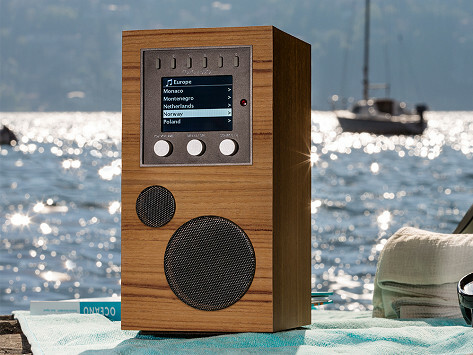 There’s even a portable, rechargeable one—the Amico—with eight hours of wireless playback and a weather-resistant wood exterior so you can listen outside. Whichever design or designs you choose, these speakers can connect to each other, too—control up to five from one device.